It took Smash customer Qiu Siyu just a few sharp blows with a baseball bat to wreck what looked like an old car radio, after which two friends battered telephones, audio speakers, rice cookers and even a mannequin, Reuters reports. Beijing, 17 January 2019 (MIA) – It took Smash customer Qiu Siyu just a few sharp blows with a baseball bat to wreck what looked like an old car radio, after which two friends battered telephones, audio speakers, rice cookers and even a mannequin, Reuters reports. 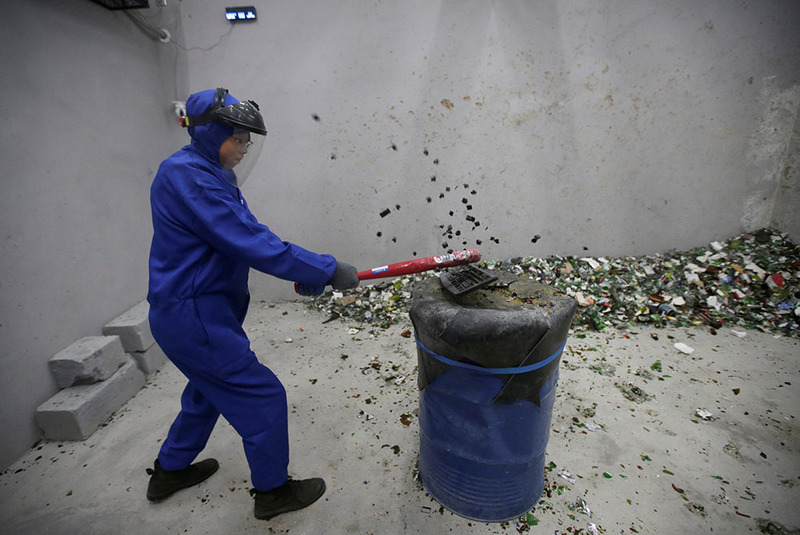 All three paid 158 yuan ($23) to spend half an hour in an “anger room” in Beijing, where patrons wearing protective gear use hammers and bats to vent their frustration on household objects while staff play music of their choice in the background. “It feels so good when I destroy those bottles and watch them explode,” she said, smiling sweetly. “If you have money, you can smash anything — smash some TVs, computers, wine bottles, furniture, mannequins, but the only thing you can’t do is to smash someone,” said Liu. “A woman brought all her wedding photos here, and she smashed them all. We welcome people to bring their own stuff,” Jin said.